This document notes the repeal of ASOP No. 16, Actuarial Practice Concerning Health Maintenance Organizations and Other Managed-Care Health Plans. Managed care health plans (MCHPs) accounted for a small proportion of total health care financing until the 1980s. The actuarial information related to them was much less abundant than for indemnity health plans. In June 1989, the ASB requested that its Health Committee draft a standard of practice concerning such plans and released an exposure draft in October 1989. At the time, the standard was written to supplement the general health insurance standards and to deal with a number of considerations unique to or of greater significance for managed-care health plans. Given the evolution of HMOs and managed care health plans over the past fifteen years, much of the information in the current standard is dated. Further, the standard gets into more detail and educational background than generally expected in an ASOP. While this type of information and guidance was likely necessary at the time it went into effect, many of the issues included in the standard are commonplace today. The current scope for ASOP No. 16 applies for actuaries “performing professional services in connection with areas requiring special consideration for HMOs and other MCHPs.” Many of the items generally refer to practice as it relates to determining liabilities and setting rates. In general, it is believed that the guidance provided in the standard is covered, either explicitly or implicitly, in other ASOPs (for example, Nos. 5, 8, 23, 28, 31, and 42). 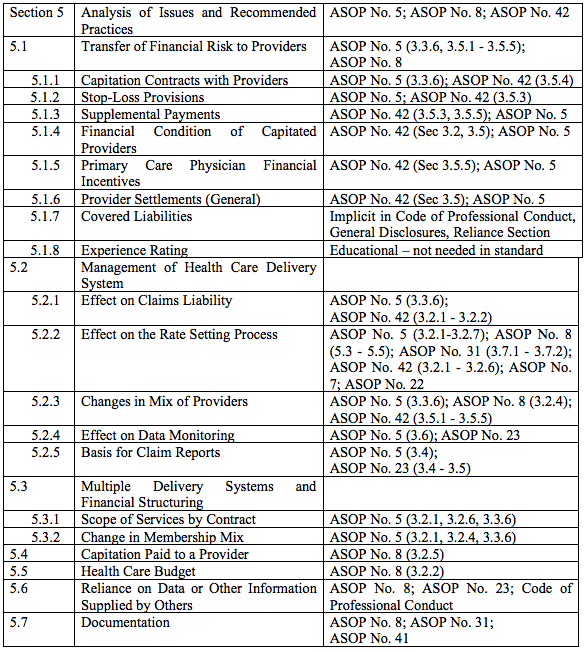 Appendix 1 provides a grid listing pertinent sections from ASOP No. 16 and a cross reference to other ASOPs, NAIC Instructions, or the Code of Professional Conduct, where actuarial guidance exists for the related item, or notes where the item was considered educational and should not be included in the body of any ASOP. The exposure draft of this repeal document was issued in a blast e-mail in November 2006 with a comment deadline of January 15, 2007 that was subsequently extended to February 1, 2007. Thirteen comment letters were received. Most comments supported the repeal, but several raised issues that were considered by the Task Force to Revise ASOP No. 16, the Health Committee, and the Actuarial Standards Board in finalizing this repeal document. For a summary of the substantive issues and the reviewers’ responses, please see appendix 2. The ASB voted in April 2007 to repeal ASOP No.16. ASOP No. 16 is repealed for any work performed on or after April 26, 2007. The Task Force to Revise ASOP No. 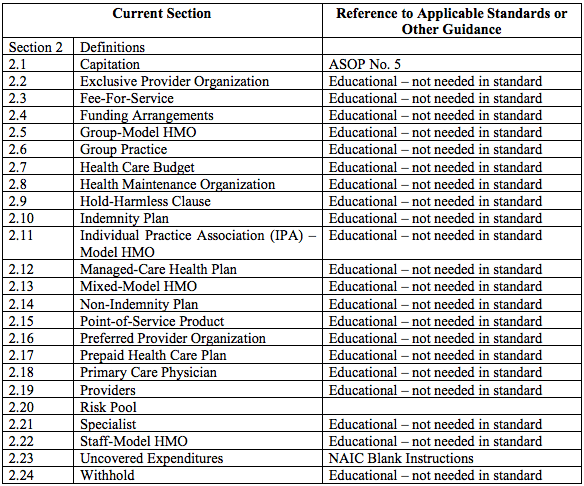 16 prepared the following grid highlighting sections 2 and 5 of the current ASOP as a cross reference against other ASOPs, NAIC instructions, or the Code of Professional Conduct to reflect where appropriate actuarial guidance already exists for the related item or where the item would have been considered educational material and, therefore, not included in any proposed revision other than possibly an appendix. The exposure draft of the repeal of ASOP No. 16, Actuarial Practice Concerning Health Maintenance Organizations and Other Managed-Care Health Plans, was issued to the membership by blast e-mail in November 2006 with a comment deadline of January 15, 2007 that was subsequently extended to February 1, 2007. Thirteen comment letters were received, one of which was submitted on behalf of multiple commentators, such as a firm or committee. Seven commentators stated they agreed with the repeal of this ASOP. Four commentators did not make any affirmative statement either for or against the repeal but did not raise any opposition to the repeal. Two of these raised certain process issues and are not included in the responses below, while the other two offered comments and suggestions. Two commentators either opposed or offered an alternative to repealing ASOP No. 16. The ASB, Health Committee, and Task Force to Revise ASOP No. 16 carefully considered all comments received.